Description of ride: Ride cycleways to Prospect Reservoir then quiet roads to historic Cricketers Arms Hotel for a cold or hot one then down the hill to Blacktown and return along the railway cycleways to Parramatta. 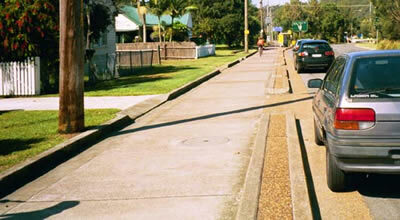 The path along Victoria St (between Walter St & Canley vale Rd) has now been completed. We experienced some really good head/cross-winds heading south on the T-way, but some even better tail-winds heading into Liverpool beside Hoxton Parkk Rd. Only a few spits of rain were felt just before L'pool, but after this it was fine and sunny — again with a good tail wind. There is still some work that needs to be done on the shared path in a few sections, but these should be completed shortly. Construction has began on the Hylands Rd to Widemere Rd missing link, it should take a few months. The RTA website shows the Mirrembeena Park path will be continued further toward Bankstown. Next stage is across Henry Lawson Drive and up the hill to the Veledrome via a number of small parks, and the large Crest Park. The crossing arrangement is made for Henry Lawson Drive is important as the speed and volume of traffic even on weekends makes the usual level crossing arrangement impractical. News from the RTA is Henry Lawson Drive is getting an overpass at Amaroo Reserve. The shared path is being referred to as Fairfield To Bankstown to hopefully it will be completed all the way to Bankstown, though the current on-road route from the Veledrome to Bankstown carries very low vehicle volumes and is low stress for cyclists. With the work under way between Blacktown and Prospect by the middle of 2005 it should be possible to travel from Blacktown to Bankstown Veledrome by off-road cycleway almost all the way. In late September, CAMWEST accompanied Fairfield Council's transport analyst on an inspection of Orphan School Creek cycleway, covering over 8 km from King Road to the Abbotsbury coffee shop. Some 2 and 1/2 hours was spent considering the good and bad points of the various road crossings. Along this route there are 8 road crossings and a busway crossing. Smithfield Rd in particular presents a ' very high risk' due to cars approaching at high speed on a downward grade. Use of the existing stormwater underpass similar to Cumberland Hwy a few kilomtres east was suggested, whilst leaving the existing crossing treatment for wet weather use. Warning signage for approaching motorists is non-existant, and it is legal to park on both oncoming and exit sides of some of the crossings. Also the warning signs for approaching cyclists are AT the crossings and give no warning at reasonable braking distance, particularly in the downhill easterly direction. Whilst traffic volumes on these roads do not warrant pedestrian crossings or lights, Council will look at the size and frequency of gaps in the traffic, as some of these crossings are a long way from traffic lights and traffic flow can be light but frustratingly continuous, leading to cyclist risk taking and cycle/car conflicts. A short section near a major shopping centre is only 1.6 metres wide, giving barely enough room to safely pass pedestrians. This area is very poorly signposted. Much of the route is 1.8 metres wide, which was considered barely acceptable for 2 users to pass safely, especially if the downhill cyclist is travelling at the 42 km/h we managed to reach on our return trip. A number of conflict situations were photographed. There is a general lack of signposting regarding the responsibilities of both pedestrian and bicycle path users resulting in many possibilities for cycle/pedestrian conflict. The entire 8 km contains one (1) painted logo indication to keep left and about 20 metres of centre line. At the new Cowpasture Rd overpass, cyclists wishing to change from the Cowpasture Rd on-road cycle lanes to this shared path must stop and lift up the gutter, a hazardous activity on a dual lane road with a 70 km/h speed limit, and part of the cycleway leads young cyclists straight to the busy road without the slightest warning or a fence. Other minor irritations discovered include failing to relocate direction signs when part of route was relocated, a location where the path doesn't follow an obvious desire line ( and the cyclists obviously do from the wheel tracks! ), crossings too close to intersections, siting of signposting in awkward spots, excessively narrow bollard spacings and cyclists having to give way to cars approaching from almost behind the cyclists, instead of path crossing the road at right angles. Expect some visible changes to these road crossings in the future, as this is where the most obvious and critical risks lie, and hopefully in the next few years we will see a joint effort from RTA and Fairfield Council to increase the width of the entire route to 2.5 metres plus at least 0.3 metres of grass verge on both sides of the contrete path. This will transform the facility from the recreational pathway it is today into a usable commuter transport corridor. This is in parts a very old route; and no-one is to blame for it's shortcomings. Fairfierld Council are identifying the problems and I'm sure will address them in due course. In the meantime, CAMWEST urges you to be extremely careful when using this cycleway and making these road crossings. On September 12th we held our Prospect Loop ride. Half a dozen cyclists braved the southerly wind for a leisurely ride around the cycleways of Guildford, Greystanes, Prospect and Fairfield. The sun kept us just warm enough but jackets were left firmly buttoned all morning. After climbing to the Western Sydney Regional Park we took the 'new route' through Wetherill Park along Horesly Drive and down Prospect Creek to Fairfield, ending up a 33 km ride. Following the creek on a slight downhill all the way, this was a nice reward for the morning's uphill battle against the wind. We rested at McCafe for coffee and muffins. Participants were impressed by the new maps showing the extent of the cycleway network, with newly completed work and other route options clealy visible in many places along the ride. Road tunnels have been blamed for pollution and fuelling Sydney's obsession with the car. Now NSW Health warns the planned M4 East could make people fat. The department insists the Roads and Traffic Authority conduct an obesity study as part of planning for the tunnel, which will link the M4 at North Strathfield with Parramatta Road and Haberfield. Four-wheel-drive owners are so arrogant behind the wheel that 70 per cent of Australian motorists do not feel safe sharing the roads with them. Sally Campbell of the University of Technology in Sydney is In Conversation about the gridlock in our cities and suggests how to tackle it. Trains, bikes, space age buses even legs may be the answer.